I've been in a Vampire kind of mood, so for this Halloween I wanted to make something fun and simple that anyone could do. This is a fun and easy family treat that any vamp would love. 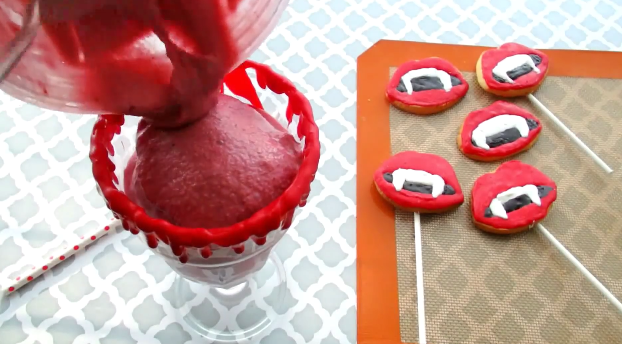 I decided to make vampire mouth lollipops and a bloody milkshake to go along with it. 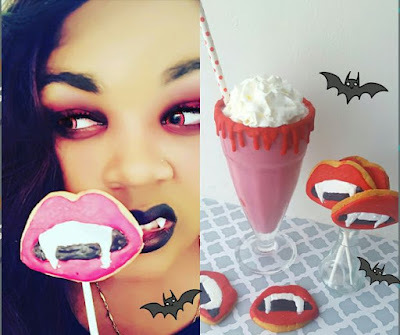 The best thing about these lollipop cookies is that you can hold it up as your own vampire mouth before taking a bite! 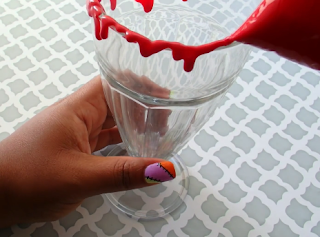 The milkshake may look bloody, but it's oh so delicious and flavored with berries. 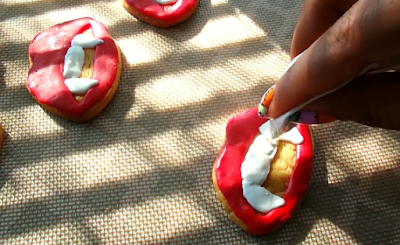 Vampire mouth stencil: Create by printing an image from the computer (or tracing). Make sure the stencil is bigger than your own mouth. 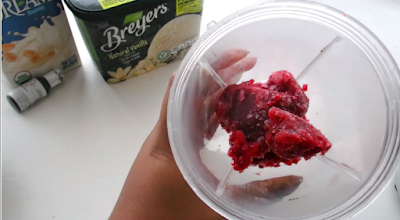 In a blender, combine all ingredients (milk, ice cream, gel dye and frozen strawberry or raspberry). 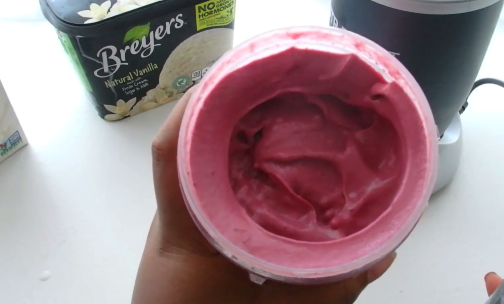 Blend until smooth and add more milk for a thinner consistency or more ice cream for a thicker one. 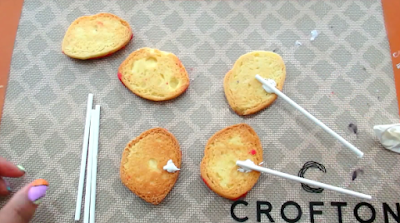 Milk the red candy melts and put in a sandwich bag or piping bag. Cut off a small corner to pipe the chocolate around the rim of the glass. Put the glass in the refrigerator until hard and repeat this process one or two more times to get a thick coating. I use a simple sugar cookie dough which is 1 box of cake mix, 1 egg and 1/2 c shortening. 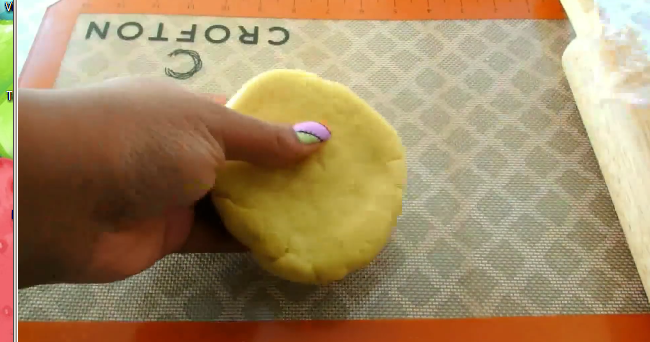 Chill for 1 hour and roll the dough out. 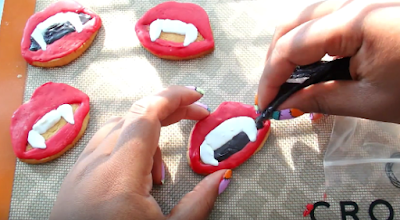 I traced vampire mouth stencil from my computer (or phone). Make sure that your stencil is a larger than your actual mouth. 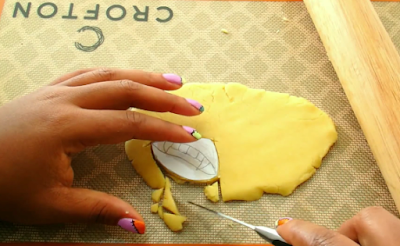 Cut out the stencil and place onto the cookie dough. Cut out as many mouths as you'd like and bake on a greased or lined cookie sheet for 10 minutes. Lips: Using the same red candy melt from the milkshake, carefully pipe the candy melt onto the cookie to form lips. 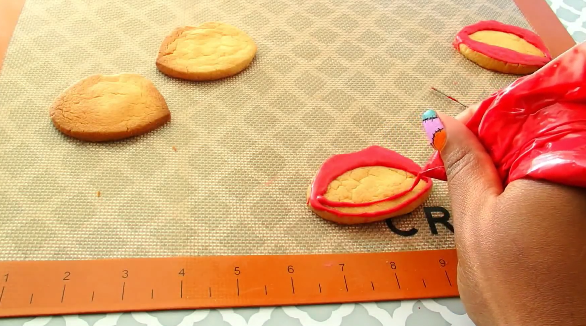 Let the candy melt drip onto the cookie while the tip of the bag is bout 1/2 inch above the cookie. This is the best method to make a neat looking cookie. 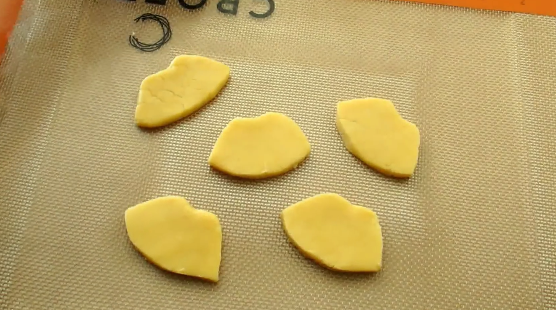 Teeth: Melt white candy melts and put in a sandwich bag then cut off the corner. Once the red candy melt hardens pipe the fangs onto the cookie. After a couple of minutes pipe the teeth in between the two fangs. Let harden. Lastly, melt down black candy melt and put in a sandwich bag then cut off the corner. Fill in the remaining uncovered space. Tip: Keep the candy melt warm to make a smooth surface. 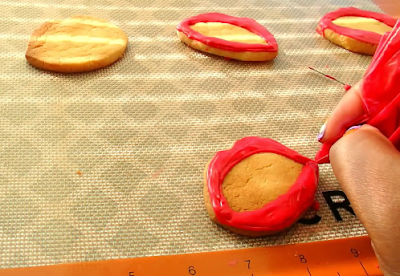 After piping each part, I held the cookie under heat to smooth with a toothpick and tap onto a surface. 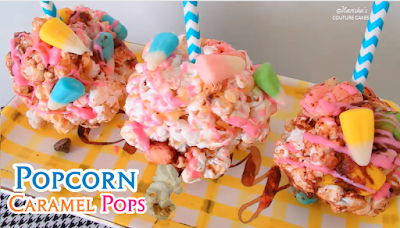 Finally, once the cookie has hardened turn it over, pipe with a small amount of chocolate and place a lollipop stick on top. 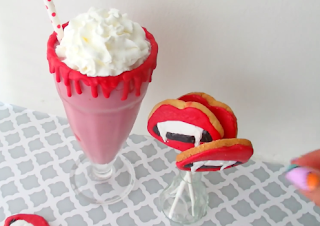 Finish the milkshake with whipped cream and a red straw. There you are vamps! 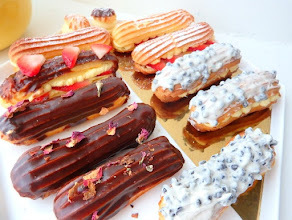 If you enjoyed this post please visit my YouTube channel and Facebook page.